Use the Record Retention Schedule Change Form to authorize a schedule change in how a type of record (or data) is disposed of. extremely useful when I needed to create a proposal to present to a financial group. It helped make fast work for something I was planning on having to take hours to format and put graphics in etc. What a time saver!." This Record Retention Schedule Change Form is included in an editable format that can be customized for your own needs. Division/Department: Insert division or department name. Name of Requestor: Insert name of person requesting change. Type of Record (Name): Insert type of record to be changed. Change Request: (Complete information regarding the request for change). Reason for Change to Retention Schedule: (in the space below provide an explanation for the change, i.e. legal, business, or audit requirement. PRINTED NAME Division / Department Manager. AUTHORIZED SIGNATURE DATE Records Administrator. AUTHORIZED SIGNATURE DATE Change Effective in Schedules or Policy: DATE. 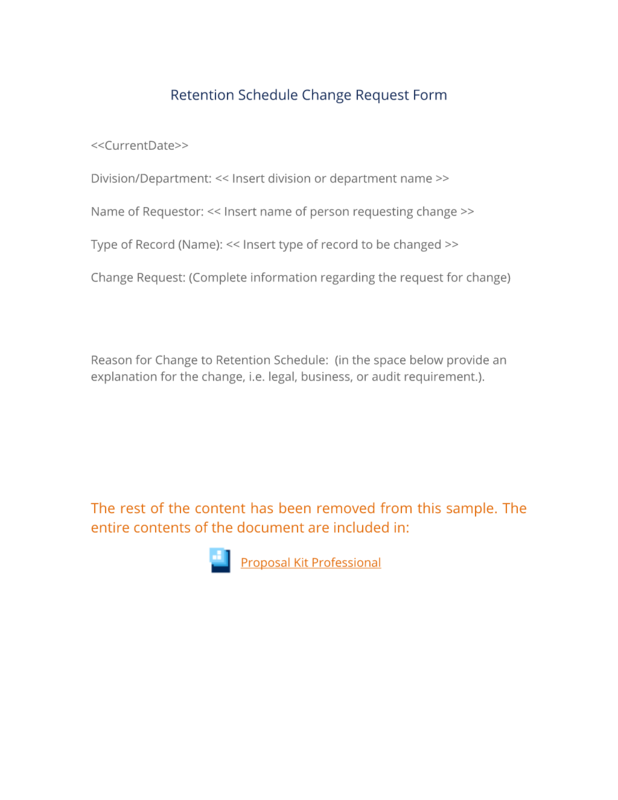 The editable Record Retention Schedule Change Form document - complete with the actual formatting and layout is available in the retail Proposal Kit Professional.